A holiday gift guide for the culinary inclined, sure to delight cooks, bakers, and inspired chefs alike. It’s the holiday season and I have put together the first ever, How to Feed A Senior gift guide, full of my favorite culinary things. Ok… that’s probably not true. There isn’t room for all such favorites but, there are a few item I highly recommend. I thought it would be fun to compile a list and share these suggestions with you Most these items are available on Amazon, and in full disclosure I must tell you, I am part of their affiliate program. That probably doesn’t mean much to you, but it means the world to me to have you purchase Amazon products through my website. I get a small kickback (like a commission) from sales that come at no extra charge to you! So, thank you in advance for visiting this page and your support throughout the holiday season (and always!). I assure you the items recommended below are listed because I love them and I hope you will too. The first gift guide I’m releasing is geared to those who love to cook. If you frequent this website then you know food is it’s center, so naturally a focus on culinary gifts is a must! It would be amiss to forgo the mention of a cookbook or two but when it comes to cooking, the culinary arts really shine when creativity is put to the test. Cookbooks full of recipes are great for step-by-step instructions and photo inspiration but if your goal is to foster one’s inner chef, then don’t give them a cookbook. Give them a Flavor Bible! The Flavor Bibles are not traditional cookbooks. They don’t contain recipes but instead, offer common food pairings allowing cooks to get creative in the kitchen. For example, let’s say you have tons of beets but little clue as to what to make. Well, just flip to the page for beets and you’ll see a list of complimentary ingredients. When you know what flavors profiles work well together, creating original recipes becomes a breeze. I highly, HIGHLY recommend these books! You do not however need both. I just happen to be a complete fan-girl and listed them both for convenience. FYI: I removed both the cover jackets so don’t be alarmed if they look a little different online. Ok, this is a bit of a shameless plug but what baker doesn’t love a wooden spoon? And these aren’t just your average wooden spoons. These are hand-carved, sustainably made, one-of-a-kind, wooden spoons! I’m talking some serious functional art in which beautiful designs equal beautiful kitchen tools. Below are two mixing spoons that might just earn you some baked goods in return. Hand carved, basswood mixing spoon. Hand-carved, walnut wood mixing spoon. Speaking of baking, another favorite kitchen tool is The Baking Journal by Magma Books. I use it to document impulse recipes and it’s been especially handy for managing the Full Moon Baking Club and quick recipes for Instagram posts. It includes blank pages for notes, a section for organizing recipes, a place for reviewing cafes and restaurants and several pages of useful tips, conversions, and reference information. For folks that are not exactly bakers but still love cooking, they might prefer The Food Journal which is very similar in design. They are basically scrapbooks for foodies but less paper craft and more for documenting thoughts, ideas and adjustments. And again, I’m telling you about these journals because I own both and recommend them because I use them! My final culinary must-have is a cast iron skillet! Every kitchen needs at least one. They are the heirloom of pans, if ever there was such a thing, cause they will last a life time and them some. Lodge Cast Iron is a quality brand that is very affordable and preseasoned for immediate use. I own three different skillets in three different sizes, a dutch oven, and a few specialty items which is to say, I can’t recommend them enough! 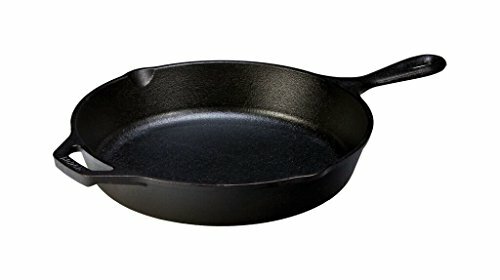 Below is a link to the skillet size I use most but I encourage you to browse their other designs because they have all kinds of kitchen delights! I’ve included a photo gallery of things I’ve made in using my collection to highlight their versatility. They are also fantastic pieces for camping trips or times when you need to cook over a fire. Also, caregivers and spoon carvers, your guides are next! Stay tuned for those suggestions. they’re coming soon! Without delay, let's just get into this shall we? The beauty of the Dutch Baby is its simplicity. It's the kind of dish that looks impressive without the headache and is easily adapted to whatever you have on-hand. It really comes down to four things. Ready? Personally, I suggest a cast iron skillet but any oven safe pan will work. I like Lodge Cast Iron for both function and affordability but again, as long as it’s oven friendly you should be good. The reason for this is because you are going to melt the butter on the stove top before poring the batter in and then transferring it to cook in the oven. Butter you could say is an additional ingredient however, it's really more about the butter's role in the cooking process and its relationship to your pan. The goal is a "pool" of butter. Contrary to everything you think you know about butter being some evil fat, trust me when I tell you that the butter is your workhorse. Do yourself a favor and buy quality and use it generously. You want enough butter to melt and swirl around the pan, coating all sides with plenty to pool in the pan when completely melted. I typically use about a 1/2 stick. You can certainly get by with less but I find that doing so influences the puff factor and that puff is what it's all about! The butter helps the batter develop a terrain of sorts, and the nooks and crannies take-on almost a croissant type characteristic. Butter makes the pastry... end of story. Doing so adds more nutritional value thereby helping to reduce a carb heavy spike in blood sugar. I try to add things to help boost protein and fiber like nuts and seeds, dairy products, and fresh fruit. As for assembly, below is a list of some things I commonly use in each category. Creamy items: Yogurt, ricotta cheese, cream cheese, whip cream, etc... These item tend to soften when met with the hot Dutch Baby and help mix the other toppings into a delicious mixture of yum! I'm not sure how else to describe it, but it's for this very reason I prefer to add my cream item first. It also serves as a landing pad for the other toppings. Fresh stuff: I typically use fruit but veggies could work too. I like berries or things sliced kinda small to scatter around whatever creamy base I used. Drizzles: Honey and syrups are my go-to drizzles but occasionally I'll stew some fruit (especially if I'm using frozen fruit) for a hybrid of the fresh and the drizzle. Sprinkles: Nuts, seeds, herbs, powdered sugar, or any specialty sugar or spices... This is the final zing! It's the small touch of detail to garnish the Dutch Baby before serving. A naked Dutch Baby showcasing the ideal topography/terrain. Lots of buttery nooks and crannies to help catch all the toppings you want to pile on! And, since we are on the subject, I'll just say that the serving is "important". This is the point where the wow factor is at its all time high. From watching the Dutch Baby rise while its in the oven, to getting it all gussied up with its toppings, it just doesn't get much better than that moment so be sure to parade it around before serving. For real though! Cause as soon as you cut into your creation, it takes on a life of its own. The baby deflates much like a souffle, and the toppings all run together which remember, is the great part of applying the creamy product first, but what you gain in taste you start to lose in appearance. The toppings pretty much spill out into the pan as you remove the pastry slice by slice but just scoop it up and throw it on your plate. This isn't a post about how you eat a Dutch Baby. This is merely telling you how you can go about creating your own. I'll quickly share that I eat mine with my hands, taco style wrapping the pastry around the fruity-creamy mess and I dredge whatever's in hand right on through any remaining butter! It's not pretty but its sure tastes good so, no shame here! Preheat oven to 410 degrees F.
Mix the eggs, milk and flour together in a bowl until thoroughly combined. In an oven safe skillet, melt the butter on the stove stop. Carefully swirl the butter in the pan and around the edges to coat all sides. Pour the batter into the pan and carefully transfer it to the oven. Bake for 13 minutes at 410 degrees F, then turn the oven down to 350 degrees F and bake for another 10 minutes. I strongly encourage watching your Dutch Baby change shape through the oven window (cheap thrills!) but whatever you do, don't open the oven door until it is finished cooking or it will begin to deflate. When it's done baking, remove it from the oven and top it with the topping combo you decide. Chef's choice! PS- a fitness related post is coming soon cause... duh! How to Feed a Senior is a participant in the Amazon Services LLC Associates Program, which is an affiliate advertising program. If you choose to purchase items after clicking on these links, I will earn a small commission at no extra cost to you.